Motherwell got their Betfred Cup Group F campaign off to a flying start with a comfortable 5-1 win at against Queen's Park at Hampden on Saturday. 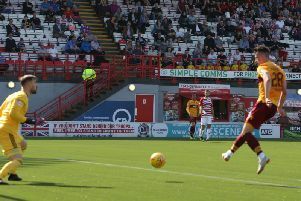 Motherwell went ahead after just eight minutes when Stevie Hammell's free-kick from the left was chested down by Alex Fisher to Chris Cadden who shot home crisply. And the visitors soon came close to making it two when the impressive Cadden's fine cross from the right was nodded just wide by former Inverness forward Fisher. But League One Queen's Park stunned their Scottish Premiership visitors with a 23rd minute equaliser which came totally against the run of play when former 'Well ace Adam Cummins bundled the ball home. Cummins' strike came after David Galt's fine inswinging free-kick for Queen's had been headed towards his own goal by Ben Heneghan. Away keeper Trevor Carson - making his Motherwell debut - did well to parry the ball away initially but Cummins was there to score against his former employers. The Spiders had been second best for most of the early exchanges so this equaliser came as a major surprise. But the Steelmen gradually regained the ascendancy and fine play by Motherwell's Richard Tait wide on the right preceded his cross being well caught by Queen's keeper Willie Muir. A Queen's breakaway on 42 minutes then saw Thomas Orr shoot well wide of Carson's goal and it was 1-1 at half-time. The Steelmen came out of the blocks quickly in the second half and soon went 2-1 up with a fine goal which was a disaster for Queen's. Two home defenders got in a fankle and Gael Birigimana brilliantly played in Craig Tanner who shot past Muir. A Cadden corner was hedaed off target by Fisher before Cummins was forced into blocking an effort from 'Well substitute Andy Rose after Frear's cross from the left. But Motherwell did establish a two-goal advantage when sub Ryan Bowman - only just on the park for Fisher - controlled a long ball and slotted past Muir. The biggest cheer of the day greeted Louis Moult's arrival as a substitute for Tait, before Bowman netted a quickfire second when he expertly lobbed Muir from the edge of the box for 4-1. Moult netted a sensational fifth with a brilliant free-kick goal which made it 5-1 after 85 minutes. Queen's almost netted a last minute consolation when Carson brilliantly saved Christopher Duff's shot. From the resultant corner, Dominic Docherty shot just over. Queen's Park: Muir, Millen, Docherty (Duff 55), McVey (Green 83), Green, Cummins, Galt, Docherty, Orr (MacPherson 72), Brady, Burns. Motherwell: Carson, Tait (Moult 76), Hammell, Heneghan, Bigirimana (Rose 60), Cadden, McHugh, Frear, Fisher, Kipre, Tanner.